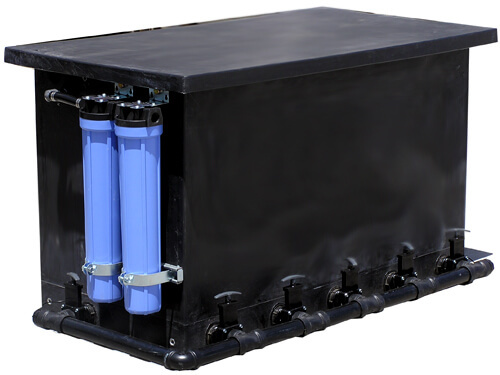 This is the newest addition of water filtration systems; improved design and increased efficiency is due to its greater water capacity allowing improved settling time for suspended solids. 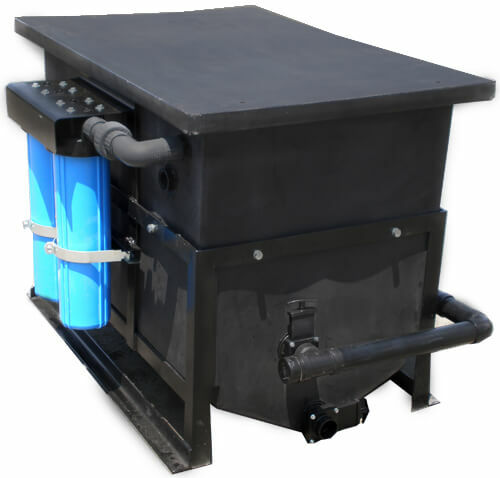 In turn, this prolongs the life of the polishing filters placed on the outside of the unit for improved clarity with a four step reduction polishing filter manifold removing suspended particles down to five microns. These water recycle systems work! These water filtration systems are built to last! With the latest design you have access to the polishing filters (4) from the outside, giving you increased settling time thus increasing the lifetime of your filters. 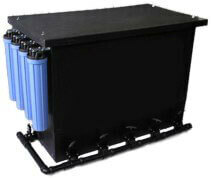 Filtering of waste water is increased by the use of four filters positioned in highest micro to lowest. Including 75, 50, 20 and 5 micron filters. 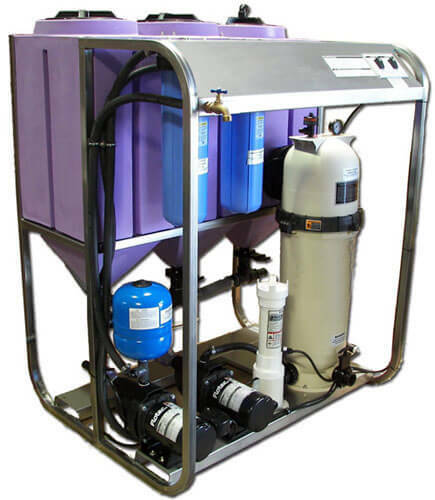 This is a portable water filtration system designed with pressure washing, auto detailing, equipment washing, steam cleaning, truck washing and graffiti removal in mind. Expected lifespan is 3 - 6 months, depending on usage. 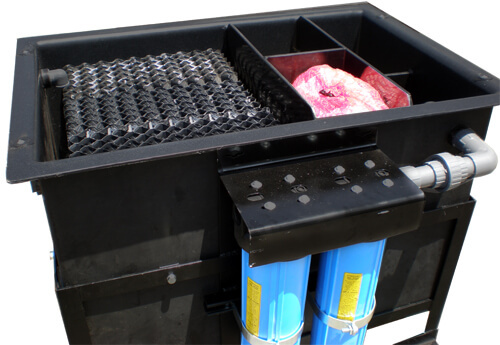 This unit is a full size Recycle System that is compact enough to fit in the bed of a full size pickup truck for delivery or demo. 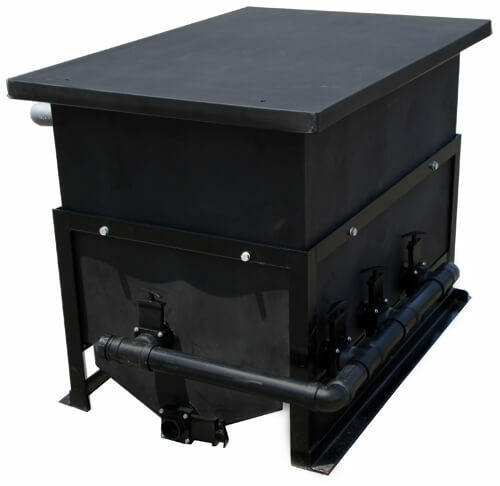 Designed as an addition to your wash pad, the 6-stage filtration process includes 3-tank oil-water-solids separation system, oil soalescing, multi-stage filtering process and on-demand water delivery system with chlorine injection and a 185 gallon water storage tank. Maintenance is simple, just clean or change the cartridges as indicated by the pressure gauge, saving you time and money. Simple to operate and maintain: Includes automatic pump controls, low water shut-off switch and replenishment valve. 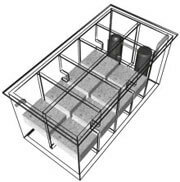 Dimensions: Water storage tank 48" x 29" x 34", system 52" x 40" x 60"